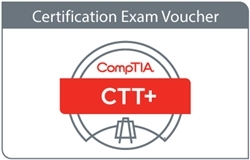 CompTIA Certified Technical Trainer (CTT+) certification validates excellence in instruction. In order to get certified, you must pass two exams: CompTIA CTT+ Essentials and then either the CompTIA CTT+ Classroom Trainer or the CompTIA CTT+ Virtual Classroom Trainer. This voucher can only be redeemed for CompTIA CTT+ Virtual Classroom Trainer, the performance-based exam for the Virtual Classroom Trainer Certification.